tv-ooh: tv we like to watch on the tv: Oh! Ben in EastEnders: Why are you and other gay soap teens basically a bit crazy? Oh! 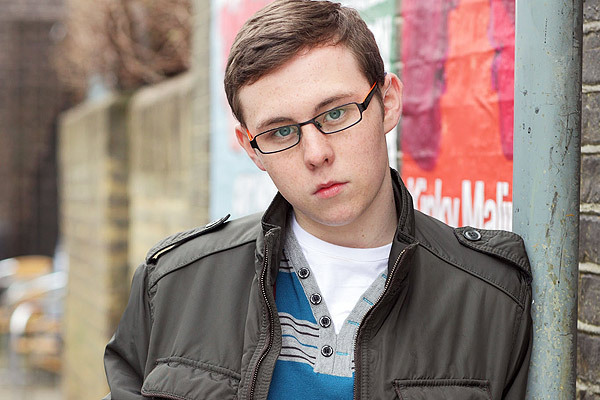 Ben in EastEnders: Why are you and other gay soap teens basically a bit crazy? Once it may well have been the key defining aspect of a character, but now, across several soaps, there are a few young gay men for whom their sexuality appears to have led to a troubled and disturbing life. In other words, they sometimes act like complete and utter loon-bags. The main culprit is Ben in EastEnders: admittedly having Phil Mitchell as a father would set any kid off on the wrong foot, but Ben's descent from gentle fan of tap dancing to glacier-eyed psychopath via an appearance-changing stay at Borstal has sometimes been a stretch to understand for even the hardiest fans of Albert Square Adventures. Recently we've seen him frame his father for the death of Phil's ex, Stella, resulting in lots of scenes involving shouting and storming off, and then Ben bragged to his half-brother Ian that he lied to police. Lord knows what his poor ma Kathy would say. And most disturbingly, he killed harmless Wham!-fan Heather with a single blow to the head, and just as she was about to marry her long searched for sweetheart, Andrew from Southend. So it feels a bit wrong - not least for poor Hev - and it will be interesting to see how Ben fares with the arrival of a new executive producer, following the departure of current exec Bryan Kirkwood. But it's not just EastEnders where we've got the troubled teenage gays: on that daily teen hormone-cauldron Hollyoaks, among a few other gay characters, we have that nice George, fond of wearing red jeans and a permanently attached blue scarf whatever the weather. He had apparently faked his own death as a result of school bullying, then changed his name before finding himself living on the streets. And over in the Grange Hill re-boot by another name (Waterloo Road), there is the young, sensitive, football-shunning Josh. Admittedly this isn't quite the same as Ben and George, but Josh has just had a 'psychotic episode' after which a doctor speculated to the boy's teacher father, when pressed, that his son could possibly maybe have schizophrenia but we don't for sure but this episode needs a cliff-hanger. On one hand it's good that these characters' sexuality hasn't hindered them from getting some decent - which in soap terms means melodramatic, and in EastEnders' case means sometimes means VERY melodramatic - storylines, and why should they. Watching the bumpy and character-led actions of EastEnders' other gays Christian and Syed and their relationship, it's clear we've come a long way from the issue-led approach of, say, EastEnders' first gay couple of Colin and Barry back in the mid-80s where barrow boy Barry had to gently explain to Dot that he and Colin 'shared the same bed sheets' (Dot was his cleaner at the time, in a bit of moonlighting from the launderette). Her reaction was probably quite realistic for the time, if almost totally unsayable now: "You've probably both got AIDS!". But once Colin's secret was out and he'd come out, he had nothing else to do, other than, er, go back in again or leave the Square. So him and his light grey summer jacket left. But putting aside today's probably well-intentioned but perhaps slightly hackneyed attempts to 'tackle issues' such as homelessness, mental health and, er, coping with a parent who's a Mitchell (and even bearing in mind the heightened, fast-paced, events-gobbling demands of soaps), questions remain. What does all this tell us? That if you're a teenage gay the process of coming out will turn you crazy? That a person's gayness can trigger huge problems, or that you can't have a 'normal' adolescence? The hope is that any young gay teenager watching these adventures take it for the slightly rum old melodrama that it is – rather than a bleak depiction of a part of them they may still be struggling to sort out. There's not much fun in soap sometimes, for anyone. Or is it more positive than that: that a person's sexuality has just become another personality aspect for a soap character, and is no longer so interesting in itself so now writers need to up the ante in some other way, as they would for any other character, gay or straight. The message - if their is one - is maybe a bit confused, but just like life, nothing is ever that straightforward - and let's all remember it's just telly. - EastEnders: "I want pizza and I want Hazell Dean!" - Oh, Pam St Clement (Pat in EastEnders): What are your post-soap options? It seems that it's not possible for writers to have a gay character in any soap without portraying them as some way 'unhinged'. It's been going on ever since Brookside in the 1980's had Beth Jordach murdering her father and burying him under the patio. They later introduced another lesbian character who was completely 'normal' to start with but then turned out to be disturbed as well. I'd be really interested to see if anyone has done any proper research into this. In a way this is negative representation which may influence uniformed viewers see gay people in a bad light. I would say that there is a huge over representation of gay characters as mentally unstable in the media and it should be addressed. I kind of agree with this article. Especially in Waterloo Road, when Josh comes out of the closet, and then a few series' later he's diagnosed as being schizophrenic. Although, I don't see it as being on purpose for all these gay lads to be all insane. The writers are just trying to make characters out-of-the-ordinary or just different. And I somewhat respect that. We have to many boring people in Soaps today, why not throw a little crazy into the mix? No hesitation the plight of homosexuals is on the top of the list of social problems professed in the EU because this week a meeting is taking place in Europe to address the fact that not everyone is getting onboard with the "gay agenda. Homophobia, transphobia and other forms of sexual orientation discrimination is said to still exist in the EU on a larger scale than the Union wants to see.